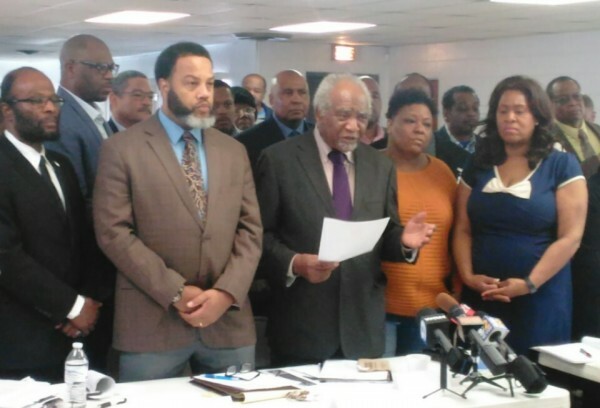 The state of black men in Chicago and how to improve their lives sparked passionate discussion among community leaders and residents at a recent West Side meeting convened by U.S. Rep. Danny Davis. The goal, Davis said, is to come up with strategies that can be implemented block by block, utilizing federal money and community-based resources. The sometimes tense session drew about 100 people last week to New Landmark Baptist Church, 2700 W. Wilcox, in East Garfield Park. Gun violence, unemployment and incarceration were cited as lingering – and worsening – problems for black men. Passions arose among attendees about how and where to address these problems. Davis said the state of black males has gotten worse over the 30-plus years he’s been working on the issue. Twenty-one percent of Chicago’s black males are currently unemployed. That’s three times more than whites, according to the U.S. Census. Nationwide, unemployment is 8 percent for black males, nearly double the national average. And black men under 24 and living below the poverty level is 55 percent – 41 percent higher than the national average. Austin’s numbers are just as startling. The community’s high school drop-out rate among that group is 21 percent. As a community, Austin had the greatest number of former inmates released from prison in 2016 than anywhere else in the state – 90 percent of them black males, according to the Illinois Department of Corrections. Those numbers follow a decade-plus trend. Between 2001 and 2016, Austin recorded hundreds of homicides; black men made up the majority of the victims. “There are no simple answers to problems that are very complex; it’s going to take ongoing time,” Davis said. Some in attendance called for more financial resources from city, state, county and the federal government. Some want money for specific trades, like construction, directed toward youth. Others suggested converting closed schools to job-creating centers. Others, like Malcolm Davis of 3C Coalition of Communities That Care, a South Side organization, demanded more direct solutions. “We know who they are and where they’re at. Just go out there and stand on that corner where they’re at and engage with them,” Malcolm Davis said. West Sider Kenneth Burkes, 18, said the solution starts with individuals wanting to improve themselves. As for getting youth off the street, Burkes stressed having a long-term view. “You want to get them off the street, you have to stay with them and give them an opportunity. You just can’t say, ‘I want to get them off the street,’ and then leave,” Burkes said. Congressman Davis stressed that solutions have to start by bringing people together, not to rehash the problem but brainstorm how to solve it. The town hall meeting underscored a generational tension between how elders and youth differ on solutions. Steveon Drisdell of Introspect Youth Services, an Austin nonprofit, agreed people need to get back out in the community. “We can sit in these rooms, in town halls and City Hall all we want and deliberate, but until we start following people who are actually headed to destruction, we’ll never know how to efficiently lead them,” said Drisdell, 30. Young black men also need an economic incentive to stop gun violence, he said. “You can get a kid to go to a trade school, but what they want to know is how will they get paid, because they’re on the street to make money fast,” said Drisdell, a program adviser for Introspect.